Mill-Max is excited to announce new additions to its family of spring pin mating products. These low profile SMT disc shaped terminals are perfect for applications where vertical space is at a premium. The new 1578-X-57-15-00-00-03-0 SMT discs are .078" (1,98 mm) in diameter and available in four heights from .025" (,63 mm) to .055" (1,4 mm) +/-.002" (,0508 mm) tall. Employing our precision-machining expertise, we are able to achieve flat surfaces on both sides of the disc with virtually no burrs. 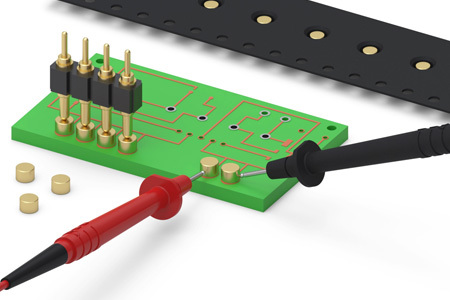 The flat surfaces are ideal for surface mount soldering and as the conductive mating surface for spring-loaded pins and connectors as well as test probes. The discs are typically placed on solder pasted PCB pads and then subjected to reflow soldering. Once soldered, the terminals are ready to be used as reliable, durable contact points. All Mill-Max Target Discs are packaged on tape & reel -- 16 mm wide x 8 mm pitch, making them simple to integrate into existing pick & place equipment and assembly processes. The tape packaging is per EIA-481-D. These SMT target discs are machined from brass and come standard with a 10 u" hard gold finish with a nickel under-plate. Custom sizes are quickly and easily achievable via Mill-Max's high speed precision-machining processes. Other plating options, such as thicker gold or other materials, are also available. You may contact our technical support team to discuss your particular application and requirements.